As investigators search for answers in Monday's Boston Marathon bombing, stories of people helping strangers amid the chaos continue to emerge. People like firefighter Jimmy Plourde and civilian Bruce Mendelsohn, who assisted a young woman injured by the blast and brought her to safety. Mendelsohn, a Bostonian who works at MIT, used a T-shirt as a tourniquet to stop the bleeding on the woman’s left leg. 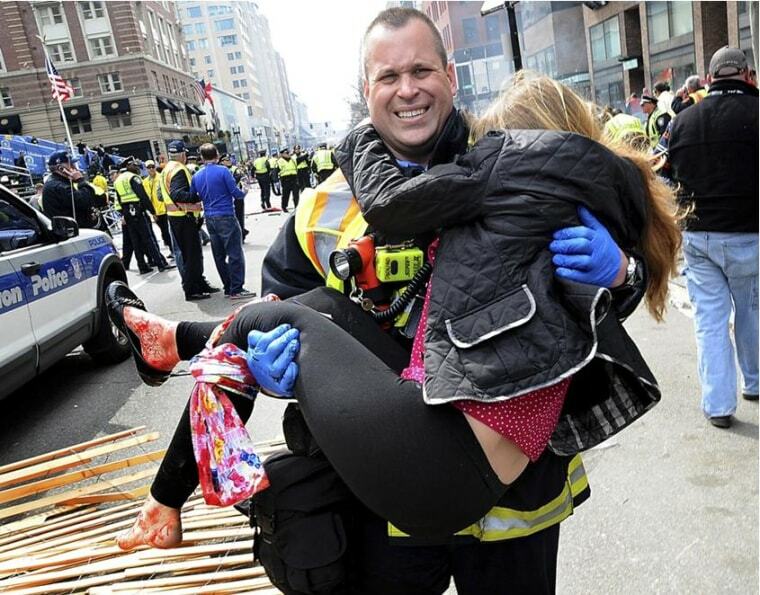 Plourde, a burly firefighter, then scooped her up and took her to safety, which was photographed in one of the many moving images from Monday. That impulse to perform one kind act at a time extended to good Samaritans like Peter de Andrade, who brought orange juice to shocked strangers on the street and brewed pots of coffee for others. Another Bostonian, Marguerite Smit, was one of many who opened their homes to runners from the marathon who couldn’t get to their hotels because authorities had them blocked off. “All I did was say, ‘Well, I’m close if you want a warm place,’’’ Smit told Sanders. Many of those assisting strangers still don’t even know the names of the people they helped, but take solace that they were able to do their part to bring some comfort. Plourde and Mendelsohn never learned the name of the girl they brought to safety, but would like to meet her someday. For now, they are just glad to know she is among the survivors.